Welcome to the 2017 NFL Draft live analysis page. This page will go live thirty minutes before the NFL Draft at 7:30 P.M. Eastern. I will give my first initial thoughts and predictions. And I will update throughout the night with my impressions as the selections are made. With the main goal of giving some insight into what type of data/analytics if any were used in the selection, and how that may or may not pay off in the long-term. Be sure to check back to this page through the draft and have a nice Draft day. Lastly, make sure you check out my 2017 NFL Draft Analytics guide here. Link is in the description. There are a lot of very talented data guys out there. But I promise you, none provide as in depth of an approach as I do. Combining all of the major facets of data evaluation including age, production, athleticism and physical characteristics backed by decades(not years) worth of evidence. The draft is already here, get your copy today. Hello Everybody, welcome to the eve of the 2017 NFL Draft. Running a little late, but I’m here. Feel free to leave a comment if you have questions. 90+ percentile explosiveness and speed. Plus Julius Peppers like market share production and a similar physical profile to most elite pass rushers. Hit both HS and College markers for a Pro Bowl quarterback. Only one year of production at a relatively older age does not bode well from a historical perspective. Questionable pick in terms of draft capital given up for. Khalil Mack market share production against top competition. Similar profile to Demarco Murray with All-Pro production. Lack of agility testing is concerning. Elite market share production, but did not dominate his level of competition the way Randy Moss did. Lack of testing also hurts his projection. Good production, but lacks elite solo tackle market share indicating an elite strong safety. And lack elite pass deflection market share in terms of an elite free safety. Hasn’t been a Pro Bowler with his market share production since the 1990s. Below average arm length. Only RBs with as short of arms to become a long-term starter since 2002 NFL Draft class were Chris Johnson and C.J. Spiller. High School production is concerning by not hitting starter level production. However, with Andy Reid as his mentor. I can see Mahomes becoming a Donovan McNabb/Brett Favre like career. Best indicators of any quarterback in this class. Elite college and high school production. Pro Bowl level production for an Edge rusher. Age is a concern in terms of All-Pro upside. Similar profile to Terrell Suggs. Lacks elite explosiveness and speed for his size to say he is risk free. Very good production and age. Did not test to judge athleticism. Lack elite level pass deflection market share. Good, but not great athleticism traits. Lacks elite length and size. Good athlete, but lack height profile of elite tackles. Lacks production and similar to Justin Gilbert in that regard. Lack INT market share to become an elite safety. Small version of Eric Reid. Above average explosiveness and flexibility. Average production across the board. Above average production across the board at a very young age. Pro Bowl level athleticism and Production. Good not great solo tackle market share. No athletic testing to determine much. Good overall physical profile, but no athleticism to determine overall upside. Best Availables for Day 2. Metric Analysis: Every indicator in Jordan Willis’ profile point toward multiple All-Pro potential. Except for his solo tackle market share score. And while there is still pushback against Jordan Willis from the “film” crowd. This is an extremely strong profile indicating at the very least a multiple Pro Bowl caliber player. You don’t have to like him, some didn’t like Vic Beasley either. However, Willis has the type of athletic ability that will be a mismatch on most NFL offensive lines. His explosiveness alone can beat many NFL offensive tackles off the snap. He may never be a consistently elite edge rusher. But many film evaluators may be over thinking Mr. Willis. Or at the very least, they over think the Edge position a lot more than they realize. Metric Analysis: Carlos Henderson has a very solid profile. Above average explosiveness, speed, and solid production. The only concerns are level of competition and flexibility. He played one of the weakest strength of schedules since 1969. And didn’t put up a dominate market share production season despite that schedule. And with athleticism traits like Limas Sweed and Justin Hunter from a flexibility standpoint. There are plenty of concerns to consider that Henderson can be good, but not great. A player who looked excellent against weak competition. But could disappoint once he makes the transition to the NFL. Metric Analysis: Kevin King hits all the numbers indicative of a multiple Pro Bowl cornerback. However, scheme will be crucial as he has average explosiveness. He’s a player who with his elite flexibility can become a dominant press corner. But you want to make sure he’s working on wide receivers in close quarters vs. having him explode to the ball in space. How a defensive coordinator schemes him up will be crucial, but in the right system he can be a star. We are finally here, with the safety group at the Combine. And there were a lot of very good safety athletes. The big standouts as strong safety types were Obi Melifonwu and Josh Jones. Both safeties I’ve talked about for awhile now, but with no agility drills, it’s hard to determine their ultimate picture as athletes. But enjoy the chart, and don’t go too crazy over the athletic comps. It’s just who they resemble as an athlete, not as important as production and film. This concludes the Combine athleticism analysis. I will have a complete examination of the RB group published on Amazon soon that will go over all the data and what to expect from each prospect in the future. 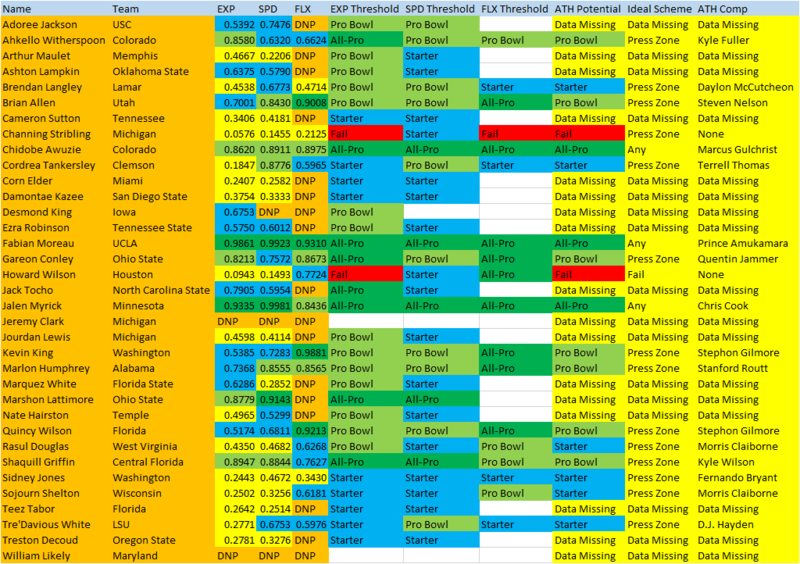 And I will publish a few teaser reports on my blog while updating Pro Day data. This is just the beginning. So if you like my work or want to know more about my work follow me on twitter @Jimetrics , or shoot an email to james_cobern@yahoo.com. Free Agency is here as while. So expect reports on how that turns out as well. This has been a fantastic Combine when it comes to edge rusher and linebacker depth. And I think we can add corner to it as well. The biggest standouts of the day were Chidobe Awuzie, Fabian Moreau and Jalen Myrick. Only one of them is Awuzie is someone I’m a big fan of. But if you are a fan of press man corners, this class is filled with them. With the best perhaps in Kevin King who tested almost exactly like Stephon Gilmore. I will need to digest these numbers a bit more in the coming months. But so far this is the chart for cornerbacks who tested at the Combine. I will have another post on the safety group, and then I will begin the long process of going through each player’s data profile. The LBs at the Combine this year performed better than in the past, but it was still a bit disappointing. Players like Zach Cunningham, Raekwon McMillan and Anthony Walker Jr. proved they have starting NFL athleticism. However, the big name from this week was Ohio’s Blair Brown. I really enjoyed his film before the Combine. And I expect a fast riser, because his athleticism is on film. Players like Connor Harris and Duke Riley had great days. But there are a few variables in their profiles that I will highlight in the future as potential red flags with them. Not a bad day for the LB group. However, too much hyperbole on some guys who hit certain marks and missed on others. The 2017 NFL Edge class is loaded, but it’s not the players you are accustomed to. Tim Williams, Takkarist McKinley and Carl Lawson posted question marks. While Myles Garrett, Jordan Willis, T.J. Watt, Haason Reddick, Tyus Bowzer, Soloman Thomas, Tarell Basham and Trey Hendrickson offer up some elite athleticism traits. 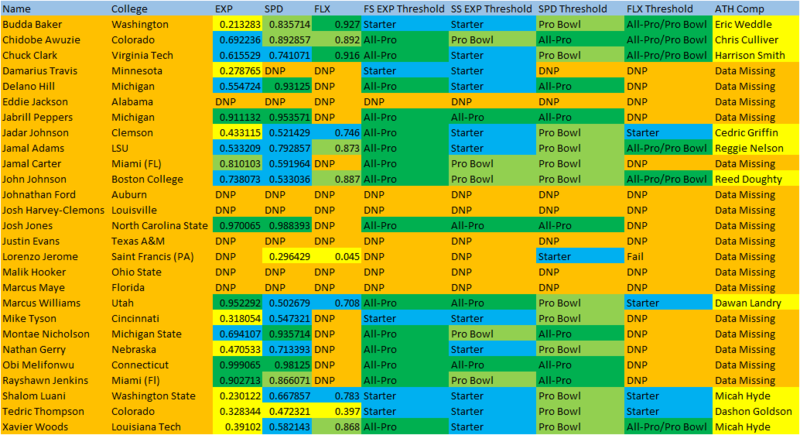 Out of those guys, Garrett, Watt, Reddick, Thomas have legit first-round potential. While Bowzer, Basham and Hendrickson can be great value adds in Day 2 to Day 3. Overall though, there is a lot of value here at Edge. I will be writing up multiple profiles explaining all the ins and out of their complete profiles. Including production, physical attributes and athleticism. But for right now, it’s clear who is a potential star and who is not. I already had questions about Lawson McKinley and Williams on film. And this just adds more ammunition to explain why. So take tuned for my LB athleticism chart later today. And happy Monday. The Edge Rushers in this class were very impressive in terms of testing at the combine, but the defensive tackles were largely a disappoint. And one thing I believe people need to understand is that when a player drops on my board. It usually is not due to me putting a player from the same position over them due to testing. As much as players at another position presented more value based on their testing. In which case I foresee a lot of other players from other positions being slid ahead of a lot of these defensive tackles. Only half of those defensive tackles have no major questions about their production, or film. While a player in Jonathan Allen and Jaleel Johnson who I’m a big fan put up average NFL starting ability. But in general there were a lot of red to yellow flags. Even Malik McDowell has a shot at being a flash in the pan type defensive tackle like Marcus Stroud. But I just feel a bit uneasy with this defensive tackle group now. I only view Soloman Thomas as a legit top 10 prospect. While Johnson and Allen will likely fall as other positional players who have shown more long-term value pop up. It will be interesting to see how the NFL reacts to this new information. But as of right now, I see believe this defensive tackle class has been a little too overhyped. Tight end is all about speed when it comes to the statistically most relevant time at the Combine. And this Combine was the most satisfying when it comes to hitting that speed mark. The majority of the tight ends at the Combine hit a very high speed score, adding to the argument that as much as some call the running back group historic. This tight end group might be a generational class. 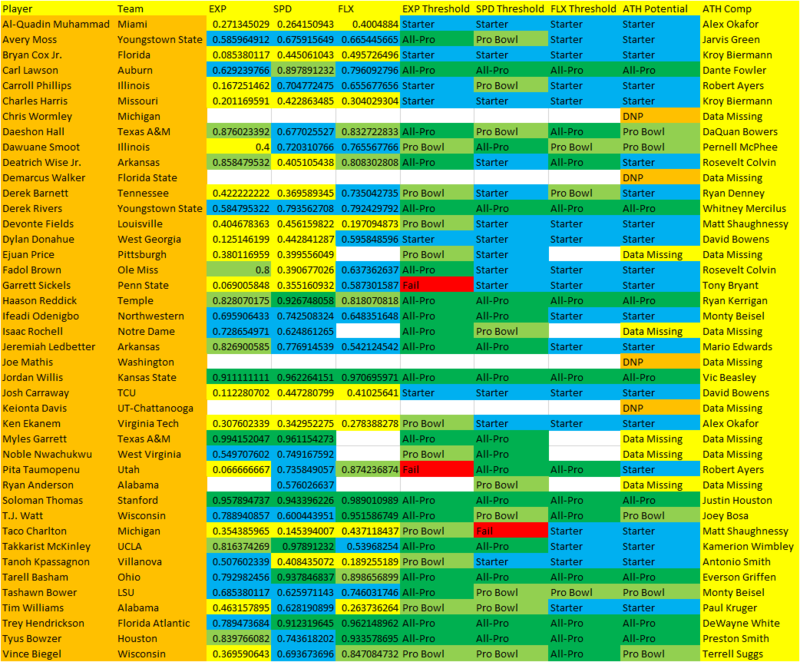 But before I get ahead of myself here is the tight end chart. Which brings us to O.J. Howard. Howard passed the speed and flexibility thresholds, but he didn’t pass the explosiveness testing for an All-Pro or Pro Bowl player. This doesn’t mean Howard will be a bust. However, it calls into question if we are overhyping him a bit as a generational tight end. Especially when you add his below average market share production at Alabama. He can improve his vertical and broad jump at his Pro Day. But at least what I’m saying is I was skeptical that O.J. Howard was a good, but not great player before the Combine due to his lack of explosiveness. And his testing is starting to show my concerns. He’s going to be a good player. However, he just doesn’t have the combination of metric traits that multiple All-Pro and Pro Bowl players had going as far back as 1963. This is why you should temper your expectations for him at the next level. There is enough doubt from film, his production and testing to say taking him in the top 10 of the draft over many other outstanding players is ill advised. Especially when you have other tight ends with better traits and are less murky projections. Howard is going to be a good tight end in the NFL. But there is a lot of data contradicting the claim that he is the best tight end in the class. This concludes the tight end group. I will be waiting on the DL and LB group numbers to trickle out of Indy. And I will probably not post again until the agility scores are leaked for those guys tomorrow.